I admit it -- I wasn't so sure about this whole you-writing-a-grown-up-book thing. Well, you win. I'm convinced. So, you've got my okay to go ahead and write whatever you want. You want to branch out into sci-fi? Mysteries? Horror? Totally cool with me. You write it, I'll read it. Sure, Jane had first read Pride and Prejudice when she was sixteen, read it a dozen times since, and read all the other Austen novels at least twice, except Northanger Abbey (of course). But it wasn't until the BBC put a face on the story that those gentlemen in tight breeches had stepped out of her reader's imagination and into her nonfiction hopes. Stripped of Austen's funny, insightful, biting narrator, the movie became a pure romance. And Pride and Prejudice was the most stunning, bite-your-hand romance ever, the kind that stared straight into Jane's soul and made her shudder. It was embarrassing. She didn't really want to talk about it. So let's move on. So embarrassing, in fact, that she's taken to hiding her P&P DVD set in a houseplant. Due to her lack of a green thumb, the plant doesn't provide a whole lot of cover, but it still makes her feel a little better about her obsession. 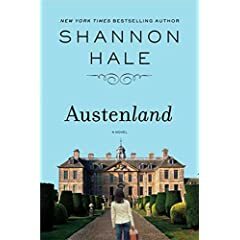 Jane's extremely wealthy (and elderly) great-aunt finds the set, discovers Jane's Secret Shame, dies, and leaves her a non-refundable three-week vacation at Pembrook Park -- a resort for rich Regency era addicts -- or as Jane comes to think of it, Austenland. She tells herself that she's going to Pembrook to kick her Darcy habit -- but deep down, she's hoping for a real Austen romance. Okay, I might be a little bit dense, but I didn't realize that I was reading what could be described as a romance novel until I was about halfway through. And when I realized it, I didn't even mind. It's just adorable. Definitely my favorite modern take on Austen. As for crossover appeal, I think that older teens who dig Austen, well-written chick lit and lighter grown-up reads will like it, but younger Hale fans might not identify much with the characters. For those who want to try it anyway, it's pretty clean. Hooray. I want to go home and read it in the bathtub. Or while eating pizza. Or ice cream. Or sitting out on the back deck in the sun, if the wind would calm down a bit. Oh, and don't miss Shannon Hale's letter to Colin Firth. Why are you telling me about this when I can't read it until MAY? That's just mean. Love the letter. So she didn't read Northanger Abbey twice? But that was the best one! Also, I am so reading this. I so want to read this. Guess I'll just have to be patient for a few months. Ugh. I've been counting down the days for this book anyway. Now it will be unbearable. Great review, even if you are evil for torturing us with it so early. Wowza. You gals are harsh. But I'd probably be saying the same thing if I hadn't already read it. Remind me again about this in May. I don't know, Leila. Maybe it's that other blog I like so much, but I think you should have to do a punishment for torturing your book audience so much. I think it involves reading that book in the bathtub while attempting to eat pizza and ice cream. Specifically taco pizza. And making a video. Come on! MAKE VIDEOS!! i'm glad, for shannon hale's sake, that people are liking this book, although i was super disappointed in it. Aw, sad, Jenn. Being disappointed by an author you enjoy (assuming that you were already a Hale fan) is the WORST. It was such a breezy little comfort-type read for me. I was pretty sure I knew how it would all work out at the end, and when it did, it just felt... cozy. So there you have it, folks. One vote for, one against. Tiebreaker needed. Anyone else managed to snag an ARC? 1. You are a cruel to taunt us with this since it doesn't come out for weeks and weeks. 2. Why the heck do I keep tripping over Austen everywhere? Someday, I will own the DVD set of Pride and Prejudice. Someone just forwarded your link to me, and I am breathing a huge sigh of relief and going for the box of organic mint Oreos (no trans fats). Not that I needed the excuse of your blog to go for the cookies (I'm a nursing mama, and I've given fair warning that I'm eating anything within my safety circle sans the baby, thank you), but I did need it for the sigh of relief. Why haven't we ever met? Or had nachos? Seems like we should have nachos. Shannon, I'm always up for nachos. Totally let me know if you're ever in Maine. It's totally cute, and it's totally going to sell well AND be read and shared. Cute book group pick. I've added a link to your review at my blog's Saturday Review of Books because I want to hang on to it and come back and remind myself when the book actually comes out. Thanks for the preview. I am a Shannon Hale fan so I'm glad to read good things about her grown-up book. I saw her at a book festival and she is funny as well as talented. Another reason to look forward to May. So I totally forgot that you reviewed the ARC, and that, therefore, I couldn't get this book yet. Cruel, cruel Leila. Finally snagged the actual book. And love-love-loved it. See? is this only sold as a hardcover ?? ?